Alex J. Cavanaugh: Get Healthy Bloghop, Fast and Furious 6 Review, Ninja News, Wednesday Movie Quote, and How to be Happy! Get Healthy Bloghop, Fast and Furious 6 Review, Ninja News, Wednesday Movie Quote, and How to be Happy! Today is the Get Healthy Bloghop! Special thanks to Gina Goa at Modern World who posted about me for the 3-UP Bloghop! The Special Edition of The Woven Tale Press is now available. Put together by Sandra Taylor, and out of thousands of posts submitted from this year's A-Z Challenge, twenty-six made their way into this "summary" of what the challenge is all about. It features several of my blogger buddies, including Chuck at Apocalypse Now, Tangent Shell, LG Keltner, Father Dragon Al, Marcy at Maine Words, and Steven Symes. Congratulations, guys! Shelly Arkon, Norma Beishir, and William Kendall have a created a group on Facebook, Authors for Oklahoma. They’re looking for fellow authors to donate a book, either virtual or paper, to be raffled off or have a donation made to The American Red Cross, and/or make a money donation. The Facebook page is HERE Contact Shelly if you can donate a book! Nancy LaRonda Johnson started a Tuesday’s Journal Past Blast, which involves posting an old journal or blog entry. She’s opened it up for others to join, so check it out. Fran notified me of this UK site – Bloggers For Charity, “Wargames Bloggers joining forces to put on a Charity Demo Game at Triples 2014.” They support the charities Men Matter and Help for Heroes, so whether or not you’re a gamer, check it out. 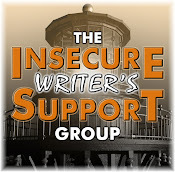 And don’t forget the Insecure Writer’s Support Group is next Wednesday, June 5! My awesome co-hosts will be Sheena-kay Graham, Suzanne Furness, and Laura Eno. Rebecca Bradley tagged me with the How to be Happy in 5 Easy Steps Meme. Love the Lord with all my heart. Love my wife with all my heart. Give to others at every opportunity. Take care of the temple, which includes my church, my home, and my body. Think that about covers it! Passing this on to Lee at Tossing it Out (because I think he’s probably ready for a happy post), Robyn at Life by Chocolate (she could also use a happy post), Mary at Play Off the Page, Hildie McQueen, and Kathe at It’s a Snap! Next week – dragon movies! Dom and the gang are back for one more gig. It’s all about the action, and watching Dom’s team race through London is awesome. The last thirty minutes really elevate the film to a new level with sequences involving a tank and an airplane. Kids, don’t try those stunts at home. Fun factor – full throttle! Hosted by Stephen Tremp, L. Diane Wolfe, Michael Di Gesu, and myself! Offer your best tips and plans to get healthy. Mine is short and simple, and it’s the best thing you can do for your body. We’re supposed to get sixty-four ounces of water a day. While some of that can come from other liquids, water is still best. Most people don’t drink nearly enough water though. Most of the time when we think we are hungry, we are actually thirsty. Rather than grabbing some chips, drink a bottle of water. (If you’re still hungry fifteen minutes later, then eat.) Water is also filling, so you’ll eat less. Thirst is a poor indicator of when we need liquid. By the time you’re thirsty, you are already dehydrated. Drinking water often prevents this. Other benefits – helps balance our body fluids, contributes to healthy skin, energizes muscles, and benefits the kidneys and other organs and body functions. Only downside is more trips to the bathroom, but that’s exercise, right? Visit others participating in the bloghop for more healthy tips! Ready to help some charities? What are your steps to being happy? Got a good apocalyptic movie quote? And what are your tips for getting healthy? I do drink a lot of water, and recently I learned that your pee isn't MEANT to be yellow, but clear, if you're drinking enough. So anyone with yellow pee needs to drink more water! Genius idea for a bloghop! I'm not sure how I missed this one! Drinking more water is a great tip! It's amazing how we can misinterpret the cry for water as a cry for hunger. I drink almost a gallon a day and I do make a lot of trips to the little girls room. Thinking about it as exercise makes me feel better. Your 5 things to make you happy fits well with the healthy bloghop today as being happy certainly boasts the health! You're right though most of us don't drink enough water, although I do drink herbal teas which I believe is pretty good too. 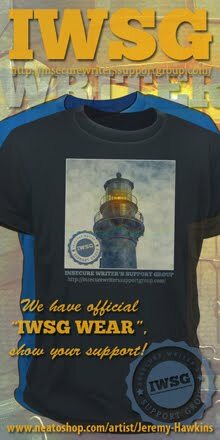 Looking forward to IWSG next week! I carry a water bottle with me all the time. Water is definitely crucial to good health. Alex, I'm still beaming from your love, support and the badge. Thanks so much for adding another honor, with the Be Happy Meme tag. I was going to remove myself from the bloghop listing, given the circumstances, but it turned out to be the perfect time to do a post on the subject. Your tip about water is so relevant. I need to take your advice and drink more water. Thanks. Congrats to those featured in the press book. Love the Get Healthy bloghop. I only drink water except for the coffee with breakfast. yes I do see more of the bathroom but as you sat even that is exercise. Nice one Alex for mentioning Bloggers for Charity! Great health tip Alex, water is essential to our survival. Glad you enjoyed Fast 6. Yes I'm ready for my close up as co-host for IWSG! *Grins* Nancy's Journal Blast is awesome. Best of luck to Shelley with donations. The Woven Tale Press summary of the A-Z was great. Love your happy ways Alex and enjoy your day. Oh and congrats on getting your 3 ups. This is a great tip, and one that most people tend to forget. I'm guilty of not drinking enough water; I get most of my liquid intake from tea. I tend to think that's ok, though, since I don't drink fizzy drinks or high sugar drinks. Good tip, I drink about 2 litres of water a day. That's about 8 glasses. I love Rebecca's steps and live them everyday. Trisha, you are correct! It should be clear. Suzanne, mental and physical health are linked. Shah, your body is harsh with you! Robyn, I'm glad you posted today! Rachna, I drink a cola maybe once a month. Sheena-kay, thanks again for co-hosting! Great tip! And so much great news. I saw F6 and actually thought it took things to a whole new level of awesome. My review is coming Friday. Excellent tip, and one that's easy to forget. I used to drink a pitcher of water each day. I've gotten out of the habit. Thanks for the reminder. Great happy tips - they obviously work for you! Sir Poops and Hair Ball gave their tips on being healthy and staying happy, too. And thank you, Alex, for informing everyone on all kinds of good stuff. Great tip. I always need to drink more water. I'm going to remember to drink before I eat. Lots of good stuff today! I'll have to check out that Authors for OK group. Drinking water is a good tip, though I also drink lots of green tea, which is supposed to be good for you. Both have 0 points in the Weight Watchers program, so why drink your points? My tip for getting/staying healthy: go to the dentist at least once a year. I loved Zombieland! Such a fun movie! I must say I'm even more curious about Fast and Furious 6 now. Also congrats to those guys who're trying to help Red Cross, it's such a great, inspiring initiative, just like your Get Healthy Bloghop! Great minds thinking alike! I posted about the importance of drinking water, too. Love your steps for happiness. So simple - and so central to everything we are. Drinking water is so simple, yet difficult! I try to slam 20-30oz right when I get up, that puts me on track first thing. Water is not my favorite thing, so we buy flavored water for me. I just don't like the lack of taste! Thank you for the mention, Alex, I was so honored to have been chosen! And boy you hit my trouble spot with your mention of water. I am a bad water drinker because I don't like it! I know, who doesn't like water, right? I have actually been making an effort to drink more lately but it isn't easy! That being said, I think water is a great thing... I have lots when I can and I am not sure why it's hard to drink the amount a day. Fast 6, I think the story took a great turn in the 5th and it will be killer for movies to come. Heck maybe like Star Trek... we will have Fast/Furies.. conventions. I can't wait to see Fast and furious 6! Hi, water and walking for me - and avoiding all the naughty but nice things but other half buys! Love your answers to the Happy in 5 Easy Steps Meme. Drink more water. Simple, yet effective! I make it a point to sip water all day long. I make sure to sip it at meals rather than Coke or other sugary drinks too. Lynda, leave your brain at the door and enjoy. Melissa, that ending sure did! Sandra, zero points is good. Marcy, you're welcome. Try flavoring your water. Jeremy, they go for as long as the leads hold out with that series! Amen on the water! I've always preferred water, but sometimes you just get too busy. Now I keep my water bottle with me all the time. It's a 25 oz one and my goal is to drink 3 of them a day. Yeah, water is so much more important than people realize. Hubby really wants to see F&F 6. I'll come to keep him company. Really enjoyed FF6 too, just shut off the brain. And yeah water is a big one, that is all I drink what so ever. But another thing to add to it, avoid that fluoride crap whenever you can, nothing but a poison. Love your 5 tips to be happy. Also, drinking more water - great advice and I love the logic of more bathroom is more exercise. Great advice on water! And steps for happiness for me- Love God, Love my husband, love my daughters, love others, and have an attitude of gratitude. Thanks for the healthy bloghop, Alex! I try to have my water bottle with me at work but other times I'm probably not getting enough water. Good tip! And totally agree about the water. Lana and I have been making good progress in improving our diet and getting a bit more exercise this last few weeks. Great tip Alex! Water is very important for a healthy body. Congrats to the A-Zers chosen... how AWESOME. I used to drink tons of water .. Like Mark, I add it to coffee. LOL. Over the summer months I tend to drink a lot more. Drink water, hands down. Flush those toxins out of your system every chance you get. Thanks for the info about Nancy's blog hop. 3 Up has been so much fun. This was a really neat hop. Five great things to be happy about and five wonderful bloggers you're sharing them with...Fast and Furious sounds like a really fun movie. Think hubby and I will have to check it out. I KNOW rhis about water, yet I still resist. Why? I don't like the tase unless it's after I've been exercising. I recently started putting Dasani drops in my water. I like that lot and need to carry those in my purse. That's quite a jammed packed post of goodies, Alex. Enjoy your blogfest and boogie boogie. I'm a water gal! No water boy jokes, please, lol! Great post and off to talk healthy and post happy to those in need! Great post - sounds like you've got the keys to happiness! And that is timely advice about staying hydrated. I have a big Nalgene bottle that I keep by my desk, so I get my 64 ounces in every day (and more if I exercise!). Hope you had a nice weekend, Alex! I got to see the new Star Trek. I really liked it. Khan was impressive. More water is a great suggestion. Especially when taking some medications or big coffee drinkers, like myself. They can dehydrate you as well. I love your five goals-- or happies. I would have to say the top mine too. Good reminder to drink water-- I try to always keep a cup or thermos of tea on my desk so I sip throughout the day. But I could do better at it. Juliana, seeing the fifth one first is a good idea. Pat, and they add it to our drinking water - scary. Michael, that's why I check the labels of the water bottles I buy. Brinda, flavor it if that's what it takes. Heather, glad you enjoyed it. More trips to the bathroom is an upside. ;) It means your body is being flushed out. Drinking water is the most important thing you can do and most people aren't aware of how little they actually drink. Great advice! My hubby is very big on drinking plenty of water and he's always reminding me to do the same. Thanks for hosting the hop! Nice tips on keeping happy, I think mine would be along the same lines...except for the second as I'm not married. I am excited for the dragon movie quote, I like dragon movies. Drink more water! Everyone needs to remember that because most of us don't get enough. Great advice! Love drinking Crystal Geyser all day and I'm donating two books to Authors for Oklahoma! I often forget to drink water. Now doing better. I saw Star Trek last week, now waiting for a chance to watch Fast and Furious. Nice five happy list. Very nice indeed. :) My quote would be from Armageddon. "Have you ever heard of Evel Knievel?" "No. I never saw Star Wars." Furious 6 was great, but I have to say the runway near the end sure seemed long. I love your how to be happy points. It's making me think what mine are. And I'm enjoying the Get Healthy blog posts today, although I didn't sign up I like reading what everyone does to get healthy. Very motivating! I guess I was picked for the publication based on weirdness (or uniqueness, if you prefer). And now I'm going to have to rent the past two F&F movies to play catch-up! I drink lots of that good ol' NC well water. Mmmm good! But we can all use the reminder to drink more. Love your how to be happy steps, Alex. I totally agree with them. I would add one. Prayerfully enter each day and you'll always stay close to God that way. I'm a fan of drinking water all day long, Alex. It's the best way to keep the skin young, and helps keep us alert as well. During exercise is another time I have to have water nearby. I'm sure my water drinking habit came from my childhood days in the south. Fast and Furious 7? Wow. I've been trying to drink more water...I can never get enough living in the high desert. I've been dehydrated once, and it wasn't fun. The Negev Desert is really hot in the summertime, and I probably wasn't drinking enough water. Going to two different health clinics in a foreign country isn't a fun way to spend a day of your vacation! Wait a boil it all down, Alex! Puts my verbose post to shame! Thanks for sharing your happy tips- lovely in their simplicity. And as always, thanks for the news round-up. This is my primary source to learn about new blog hops, book releases and author news. I have no bloody idea how to keep up with it all, but i'm glad you do! Hart, you're in the middle of a tour - no worries! Morgan, or scary, one of the two! Thanks, that made me laugh. Al, that is a funny quote!!! Leigh, not for any of the male leads? Beverly, thanks - I try to stay informed. I have a yoga instructor who tells us to drink water whenever we feel hunger and wait ten minutes to see if those feelings go away before eating. So often they do. I'm on the water diet for sure! It rocks -- is inexpensive, gives the body so much, and helps clear out the bad! One habit I will never change! There's a Fast and the Furious 6??? I've not seen any of them, but I remember when I taught third grade many years ago, the boys in my class were quite taken with the first one. Where has time gone? I'm off to drink some water now--my beverage of choice! Thanks for heads up on the Oklahoma fundraiser. It's an easy way to help the cause & I'm all in. I did the happy meme today, as well. I was a bit confused as to what I was supposed to do. I agree on the water thing. I get horrible muscle spasms if I'm the least bit dehydrated. I think I drink must drink 2 gallons a day to keep them at bay. From someone who tends to be on the dehydrated side all the time, this is good advice! I'm a huge advocate of water. We've been, pretty much, sugary-drink free at our house for the better part of three months and don't miss it a bit. LOL! Yes, that counts as exercise. You'll find that those trips are more frequent when you increase your water intake in the beginning. Once your body becomes accustomed to it you will find you don't make as trips. Excellent point on hunger versus thirst. Your points to be happy--spot on, Alex. If one does #1 on the list, the rest fall nicely into place. I drink more water than anyone I know, although, lately, it's sometimes tea. Yes, I believe Pi found his faith, but he did it by doing what his father said, choosing to believe in something even if that something isn't the truth. The story has to come back around to that otherwise there's no point to it. I love water, and I always drink lots. I always take a bottle with me if I'm going out for a while too. And Fast and Furious 6 sounds pretty good. I'm definitely a fan. Can't quite believe there will be a F&F7 though!! Aw. Your how to be happy segment was really nice, Alex. Thank you for the important reminders. Also, love the Zombieland quote! Are you getting excited for the series? I'm a bit nervous since it will be a different cast. This was directed at me! The one thing I NEVER do is drink water (besides tea/coffee)... now I'm feeling guilty! Congrats to all the A to Z'ers who secured a place in The Woven Tale Press! You always host the best blog hops! I'm drinking my water today - I'm up to 40 oz so far! I quit drinking soda a few months ago (hardest thing I've ever done) so water and tea are about the only liquids I take in. So far, so good! i totally need more hydration! great tip! and f&f6, my boys love those movies! Good tip with the water; I often have a drink whenever I feel a pang of hunger as a stopcheck to make sure it's not just thirst. Great idea with the Special Edition of The Woven Tale Press. I will definitely check this out. Hildie, glad you are back! Susan, the first one was over ten years ago - whoa! Nancy, that might even beat me for water consumption. Andrew, but what happened to him was the truth. His faith was all over the map in the beginning, but through all that, he found his focus. Stacey, they feature the villain at the end! Shell, you're welcome, and skip F&F 3. Birgit, haven't seen it, but I'm already convinced fast food is evil. Jamie, that made me laugh. Great tip, Alex. And, just an FYI, if you don't like water, try sparkling water and pretend it's a vodka tonic. Interesting wonderful summary of A-Z on The Tale Woven Press...! I like your advice on how to be happy! I'll go check out those charity things. The truth doesn't make it more than a metaphor. God is the Tiger that came into him and kept him alive. Once he landed, the Tiger left him without saying goodbye. So, as he put it, he was the Tiger and the Tiger was with him. So, yeah, it was "the truth," but it wasn't what actually happened. But, then, we could go back and forth about it all day, which is probably why the author wrote it the way he did and why it's called "deep." Great advice and post. The water tip is sound. Since moving to the dessert, I had to get better at drinking water. Glad you liked Fast & Furious. Aah..yes! Drink more water- so very important and something I always forget to do. :) Love you ways to be happy, too! Good tips for staying healthy and for being happy! Vik, now you can benefit from it! Andrew, I never got that Richard Parker was a tiger. Sometimes, a tiger is just a tiger. I drink tons of water. I started a few years ago to help lose weight. I don't get headaches like I used to and I also don't get heartburn like I did. It's great. Water is good. Looking forward to IWSG next week. My oldest daughter is a huge Fast & Furious fan. My main tip for getting healthy -- exercise. The older I get, the more I need to stretch and do some kind of workout pretty much every day or I feel kinda stiff. And yes, Alex, you give to others at every opportunity. Thank you. Thanks for hosting the get healthy blogfest. It's fun. I drink a lot of liquids each day. Loved Gina's Ups for you, Alex, and it's all true! Thanks for the FF6 review as well. I've been thinking of checking this one out, but when you get to number 6 in a franchise...it sometimes gets a little stale. Looks like I have another movie to add to the list, though! Arggghhhhh! Another blog hop! Okay, that's better. I'm okay now. I'm happy most of the time. A healthy diet, balanced exercise and utilising positive resources is all conducive to our mental and physical well being. Fast and Furious Six is the number one movie in the UK. This is a fun blogfest! I find keeping bottled water at my desk at work helps me remember to drink... Otherwise I tend to forget until I'm reaaaally thirsty. Candilynn, thanks! Just fast on the draw. Helena, thanks - I try. Randi Lee, this series is in full stride right now! Gary, most of the movie takes place in London, so that doesn't surprise me. Lots of great news today! Drinking water is one thing I do right for myself. I rarely drink anything other than water. A good tip to staving off a craving is to brush your teeth. Nothing tastes good with toothpaste in your mouth! I was very excited to be featured in the Woven Tale Press edition of the A-Z. Too cool...and lots of other great posts in there. I like the Fast and Furious movies for the three reasons listed...just a fun, tense escape for an hour and a half. Water for sure is top priority...good filtered water. My favorite apocalyptic movie quote is from Apocalypse Now when Robert Duval utters those immortal words. "I love the smell of napalm in the morning". I need to see Fast 3-5 lol. I saw most of Tokyo Drift but missed the end. I need to up my water intake. Drinking more water should seem to be common sense, but not enough people do this. Me, for example! I so need to drink more water!!! I am definitely going to try the drinking water and waiting 15 minutes to see if I'm still hungry! What a great tip! I've been drinking more water and less soda. Oh, Fast and the Furious 6. I dog on it, but I'll probably rent it on DVD, shut off my brain, and enjoy it. At least I admit it. Also, as a lifelong health freak my advice is this: still enjoy yourself. If you pledge to never again eat chocolate, or bacon, or ice cream, or anything else you love, you're gonna fall off the wagon and quick. Save those for treats to reward yourself, and eat them in small doses. Give yourself something to look forward to, rather than thinking of every meal as something you dread. I need to finish FF6. Oh man, which dragon movies? Are we going to discuss Sean Connery and how the CG of Dragonheart holds up surprisingly well? Chuck, those words are indeed immortal! Debra, skip number three and start with number four. Brandon and Bryan, exactly. Free days are cool. John, whatever dragon movie quote you'd like! I love your common sense ways to live happy. Sometimes we try things out of reach to make us happy when all we really need are those things closest to us. I drink lots of water. Love it. LOVE your happiness tips. Yes, that covers it for sure. And your health tip...I totally agree. I may not do all things right when it comes to health (I like chocolate and Jolly Ranchers a bit too much), but when it comes to water, I get my daily fill and then some. Ninja Captain Alex's army rocks, as always! Yeah, water is the very essence of life. However (Trisha), there really is nothing wrong with your urine being yellowish; you should be bothered when it's dark red or something like that. I like the 3-up idea. I'd love to think that majority of people I know sincerely have up to 3 ups to attribute to me. And for fast and furious, what are the women gonna do with all that testosterone? You're so right about dehydration. By the time you feel really thirsty, your body is already suffering. I agree with the water drinkage. I definitely don't drink enough. Also I've been getting back into daily vitamins. I honestly don't know how beneficial those are, though! 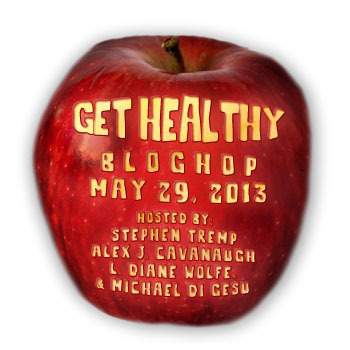 I'm very codependent and a lemming at heart so I don't know how I feel about the idea of a "Get Healthy" blog-hop. Crap. Now I'm going to have to think healthy thoughts. Guess I'll go have a glass of water. Peter, that is a problem! And hopefully the women just enjoy. David, classic line, and some vitamins are better than none. Alex, I've been racking my brains on a topic for June's IWSG and I'm just comin' up empty. I don't want to beg off the group entirely again but I did want to let you know it's possible I might not post for it this month. I will keep trying to come up with something between now and then, though. My husband and I eat pretty well, too. I make sure we have fruit and/or vegetables with each meal. We have the NutriBullet, which is awesome. I love making a healthy veggie/fruit drink for breakfast after my workouts! Excellent ways to stay happy!! Congrats to Al (I have a special affinity for the dragon) and all the other bloggers! I use your reviews (and Livia's) as the basis for my movie picks...finally saw "Momento"...good movie. Great tip for getting healthy. I FINALLY (after forever) got my husband to stop buying juice and soda at the store. If it isn't in the house, nobody can drink it and it's just empty calories. I'm a water girl all the way. Love your happy list - definite ways to keep joy in your life. And water is so very important. Love your list of five things to be happy. :) And drinking more water is great advice, too. I always feel better when I remember to do that. Wait a minute! Are you saying my posts aren't happy? Let me go get some water to drink while I think on this. I'll get to that happy post toward the end of June. Only, I don't have a wife. Water also helps those of us with allergies and sinus issues. Great advice! Grats on the 3 UP and wow, lots of news. Your 5 easy steps are great! Suze, post something encouraging then! Laura, I will have to look up the NutriBullet - never heard of it. Elizabeth, glad you finally saw it! Karen?tamera - good for you! I love your How to Be Happy tips, Alex!!! I do drink water during the day, but I do need to increase it. My weakness is Coca Cola. I only drink it 3-4 times a week, but I crave it! I thought you would post something about push-ups and crazy workouts and I was like *NO* but then you said drink water! And I was so happy! Because exercise = not my thing (although I'm underweight, actually, high metabolism or something. But it might catch up to me sometime *knocks on wood*). So water, here I come! Love How to be Happy!! and Shelly's book looks fabulous! We must be on the same wave length today. Just this morning, as I was enjoying my first cup of coffee, my very first book popped into my head. Just like that. I thought, interesting that most people's first book never see the light of day. My middle grade story is one of them. Your post gives me new hope for the story. Just maybe... Funny how my morning thoughts coordinated with your IWSG post. Thanks for hosting this blogfest, Alex, and for always being so encouraging and upbeat. I agree that a manuscript just might shine if polished just right! Thanks for your comment on my 'Get Healthy' post about my son's interests in Taeqwando. I wanted to have more photos from a walk around where we live, but student-teaching has taking a lot of my time. You are right about drinking just clean fresh water! Good to have along when taking a walk or jogging. I learned something from your post that I did not know, that being thirsty means that you are already dehydrated. I'm going to drink more water! I am also late with my iwsg-post. I am planning to post something short today, anyway, and try to go around to other blogs, but I need to write a paper for the university as soon as possible, so it may take some extra time. Sorry I am so late. Please don't remove my name from the iwsg-list. I like your five steps to being happy. Nice.